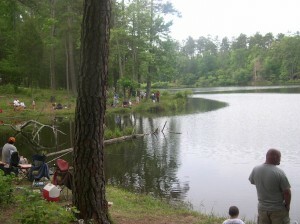 Lick Fork Lake in Edgefield County was alive with fish and anglers today. Most of the folks fishing were young, as it was the Jimmy Shay Memorial Fishing Rodeo for young people. The mission of the day is to give young people this treat as a deterrent to thinking of drugs, ever. “Get Hooked on Fishing, Not Drugs” is their motto. Fathers, mothers, uncles, aunts and grandparents brought children from all over the county as well as from nearby areas of Georgia to enjoy the day. There were a number of official groups out helping: Law Enforcement, the Future Farmers of America, and the Forestry Service, to name a few. This is the Snodgrass family from Modoc who came early to fish and caught these two (1 lb. and 1.25 lb.) catfish. 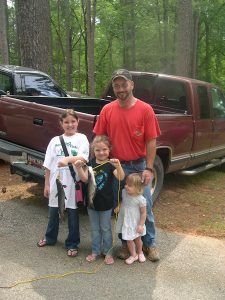 Kaylee (left) caught the larger of the two; her sister Chloe caught the second fish; Young Brooklynn joined her father Hughie for the picture. Mother was standing by, not pictured. 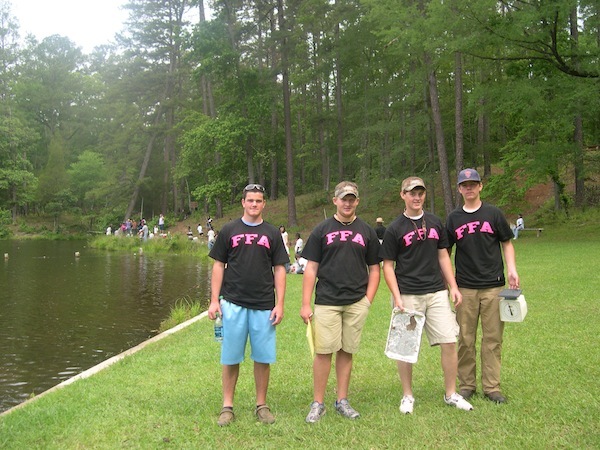 The Future Farmers of America were weighing fish and helping with the Fishing Rodeo.